← One Fish. Two Fish. Red Fish. Little Fish. No matter what you call the guy, June 19th is the day the world celebrates them. Love, Me is no exception; Love, Me digs Dads. And because we know you are all busy getting organized for summer vacation, Love, Me has put together a short and sweet list of goodies that would make awesome Father’s Day gifts. Writer Dad: Not every Dad is a journaller but locally made My Handbound Books are for more than keeps of secrets. These journals are great for travel diaries, meal and wine notations, novellas, musical notations, but he will most likely use it to list all your amazing attributes. Breakie Dad: Who doesn’t like breakfast? 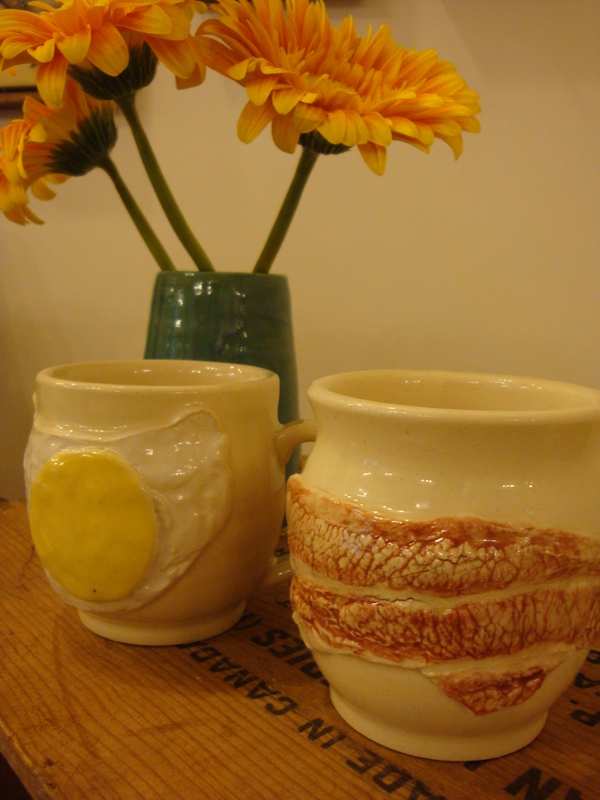 Local potter Bethany of Bread and Butter Pottery has recently stocked Love, Me with egg and bacon mugs. Awesome! If Dad is more a stack of pancakes kind of guy, we also have porcelain maple syrup containers made in Montreal by Marianne Chenard. Drinker Dad: Does Dad partake in libations? Love, Me is a big fan of the crazy fun printed glassware by local artist Kyla Francis and to us they are a “no brainer” for anyone who enjoys a cool bevie (even if it is water or lemonade). Another great idea – the hand tooled vegetable tanned leather covered flask from Hamilton’s Shoot From the Hip. Classy Dad: The bowtie is making a comeback especially the crafty looking ones in great vintage prints and sweet summer ginghams. 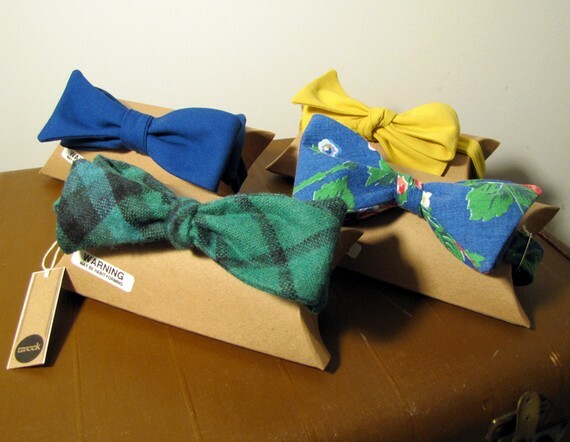 Love, Me has some pretty little printed (and solid) bowties made by Toronto’s Tweek perfect for your dapper Daddy-o. Commuter Dad: So Dad is super city savvy and commuting via mass transit or people power but is still struggling with various bags for his files and electronics. Toronto’s MariClaRo to the rescue. Love, Me has a couple of their amazing laptop bags. (And I am not being all salesy here. They are amazing. The laptop portion is built into the structure of a larger courier bag. Lunch explode in your bag? Water bottle begins to leak? No problem. The laptop is safe and sound. I leave you with this beautiful piece of writing by Merlin Mann that I came across in my travels, about having a great Dad and trying to be a great Dad. Keep the hanky or tissues handy.